Received: February 22, 2016; Revised: June 1, 2016; Accepted: June 14, 2016; Published online: January 1, 2017. We attempted to examine the relationship between abnormal findings on high-resolution manometry (HRM) and videofluoroscopic swallowing study (VFSS) of the pharynx and upper esophageal sphincter (UES), and to identify the risk factors for aspiration. We performed VFSS and HRM on the same day in 36 ischemic stroke patients (mean age, 67.5 years) with dysphagia. Pressure (basal, median intra bolus, and nadir), relaxation time interval of the UES, and mesopharyngeal and hypopharyngeal contractility (as a contractile integral) were examined using HRM. The parameters of VFSS were vallecular residue, pyriform sinus residue, vallecular overflow, penetration, and aspiration. The association between the parameters of VFSS and HRM was analyzed by the Student’s t test. Three (8.3%) and 4 (11.1%) stroke patients with dysphagia had pyriform sinus residue and vallecular sinus residue, respectively, and 5 (13.8%) patients showed aspiration. Mesopharyngeal and hypopharyngeal contractile integrals in patients with residue in the pyriform sinus were significantly lower than those in patients without residue in the pyriform sinus (P < 0.05). Relaxation time intervals in patients with aspiration were significantly shorter than those in patients without aspiration (P < 0.05), and multivariate regression analysis revealed a shorter relaxation time interval as the main risk factor for aspiration (OR, 0.03; 95% CI, 0.01–0.65; P < 0.05). Manometric measurements of the pharynx and UES were well correlated with abnormal findings in the VFSS, and a shorter relaxation time interval of the UES during deglutition is an important parameter for the development of aspiration. The objective measure of pharyngeal strength is pharyngeal manometry. Until recently, several studies have evaluated the relationship between measures of VFSS and pharyngeal manometry. Solid state computerized manometry can provide potentially important additional information in the diagnosis of dysphagia patients8 and manometric measures such as pharyngeal maximum pressure and upper esophageal sphincter (UES) residual pressure were suggested to be reliable indicators of possible pressure deficits of swallowing.9,10 However, although the studies have confirmed the close relationship between VFSS and manometry, they could not suggest the possible mechanisms of VFSS findings based on the results of high-resolution manometry (HRM), probably due to the lack of manometric metrics reflecting the physiologic status of the mesopharynx, hypopharynx, and UES. Recently, simultaneous examination of the HRM and VFSS was verified to be helpful in understanding the swallowing mechanisms, and also new manometric metrics were developed for the analysis of pharyngeal and UES function.11 Therefore, in this study, we attempted to evaluate the relationship between new manometric metrics and abnormal VFSS findings in stroke patients with dysphagia, and to investigate the risk factors for aspiration. Between October 2013 to June 2015, 36 ischemic stroke patients with dysphagia were included. Patients were enrolled according to stroke criteria defined by the World Health Organization based on magnetic resonance imaging. Underlying diseases and past history of patients were reviewed. Patients were included at least one of the following criteria; when they have (1) clinical symptoms of dysphagia, such as coughing, chocking, or drooling, (2) clinical signs such as wet breath and gurgling sound while eating or drinking, lack of tongue movement, gag reflex, and laryngeal elevation or vocal cord paralysis, or (3) patients were considered for removal of the feeding tube after an acute period of stroke. Exclusion criteria were as follows: (1) active cardiac, respiratory, and other severe medical conditions, (2) hyperacute stroke, (3) transient ischemic attack, (4) prior or current structural lesions causing oropharyngeal dysphagia, and (5) other neurologic disorders causing oropharyngeal dysphagia, such as Parkinsonism, dementia, and neuromuscular diseases. The study protocol was approved by the Sungkyunkwan University Institutional Review Board, and informed consent was obtained from each participant. A solid-state manometric assembly with 36 circumferential sensors spaced at 1 cm intervals (4.2 mm outer diameter) was used (Given Imaging, Los Angeles, CA, USA). Before the recording, transducers were calibrated at 0 and 300 mmHg using externally applied pressure. After a brief interview and examination to ensure the absence of gastrointestinal symptoms and to perform anthropometric measurements, subjects underwent transnasal placement of the manometric assembly. Studies were done in a comfortable sitting position after at least an 8-hour fast. 2% lidocaine was sprayed into the nasal cavity of the opposite side of the paralysis. The manometric catheter was inserted into the anesthetized nasal canal, positioned to record from the mesopharynx to the UES, and was fixed in place by taping it to the nose. The manometric protocol included a 5-minute period to assess basal sphincter pressure and five swallows of 5 mL water. The swallows were excluded if there were extreme delay responses of pharyngeal contraction after the swallow initiation or dry swallows without 5 mL of water. This study was performed with the patient seated in a chair. Patients swallowed 5 mL of water twice. The lateral view of swallowing was recorded with C-arm (ZEN-2060; Genoray Co, Seongnam, Korea). A blinded rehabilitation physician analyzed the VFSS findings, which consisted of vallecular residue, pyriform sinus residue and aspiration by the method used in the earlier study.12 Vallecular and pyriform sinus residues were graded as follows: grade 0, no residue; grade 1, less than 10% of height of vallecula or pyriform sinus in VFSS imaging; grade 2, from 10% to 50%; grade 3, above 50%; and defined as absent (grade 0) or present (grade 1, 2, and 3). Penetration was defined as: the residue reaches but does not pass through the glottis. Aspiration was defined as follows: (1) visible residue below glottis reversed by reflex coughing, (2) small amount of residue through the main airway, but not detected on chest X-ray, or (3) large amount of residue through the main airway and detected on chest X-ray. All data are expressed as mean ± standard deviation or median (interquartile range). We used the mean values of HRM to evaluate the relationship with findings of VFSS. Comparisons of metrics between participants with normal and abnormal VFSS findings were made by the Student’s t test. With respect to the relationship between manometric metrics and residue in pyriform sinus, both reduction in hypopharyngeal CI and relaxation abnormality of the UES can be responsible for this abnormality. Therefore, patients with dysphagia were divided into 2 groups based on these abnormalities on manometry; patients with low hypopharyngeal CI and short relaxation duration of the UES, and then the correlation was separately compared between hypopharyngeal CI or relaxation duration of UES and residue in pyriform sinus. The alpha level of significance was set at P < 0.05 and the power in sample size calculation is 80%. We used statistical consulting service for checking the normality of all data. Area under the receiver operating characteristic curve for discriminating between patients with and without aspiration was calculated. Sensitivity and specificity for detection of the patients with aspiration was determined by obtaining the highest sensitivity values with target specificity set at > 60%. All analyses were performed using SPSS version 18 (SPSS, Chicago, IL, USA). Of the 36 ischemic stroke patients (22 males and 14 females), 19 had a supratentorial lesion, 13 had an infratentorial lesion, and 4 had both supratentorial and infratentorial lesions. The mean age was 67.5 ± 14.2 years. Twenty-two (61.1%) patients were oral feeders and 14 (38.9%) patients had feeding tubes. 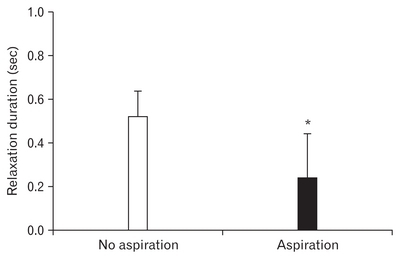 Twelve (33.3%) patients had a history of aspiration pneumonia. Eleven (78.6%) of 14 tube-fed patients had feeding tubes for unconscious acute stroke, 2 (14.3%) patients had experienced recurrent aspiration pneumonia during a feeding tube, and 1 patient (7.1%) had a feeding tube for dysphagia and aspiration pneumonia after oral feeding. Study was performed within 1 to 6 months from the stroke attack. On VFSS, the severity of pyriform sinus or vallecula residues was almost the same in all 5 swallows in a patient and consistent with repeat tests. Also, pharyngeal contractility and relaxation time of UES were consistent between the 5 swallows of the same patient. Three (8.3%) patients and 4 (11.1%) patients had pyriform sinus residues and vallecular sinus residues, respectively. Also, 8 (22.2%) patients, 11 (30.6%) patients, and 5 (13.8%) patients showed vallecular overflow, penetration, and aspiration, respectively (Fig. 2). On analysis of the association between pharyngeal contractility and residue, mesopharyngeal and hypopharyngeal CIs in patients with residue in the pyriform sinus were significantly lower than those in patients without residue in the pyriform sinus (P < 0.05, respectively). The mean values of mesopharyngeal and hypopharyngeal CIs in patients with pyriform sinus residues were 5312 ± 5561 mmHg · sec · cm and 6991 ± 13 678 mmHg · sec · cm, respectively, and the corresponding values in patients without pyriform sinus residues were 18 770 ± 10 644 mmHg · sec · cm and 28 274 ± 17 259 mmHg · sec · cm, respectively (Fig. 3). Figure 4 shows the results of analysis of the relationship between relaxation time intervals of the UES and abnormal finding of VFSS; aspiration. Relaxation time intervals of the UES in patients with aspiration were significantly shorter than those in patients without aspiration (0.24 ± 0.20 seconds and 0.52 ± 0.11 seconds, respectively; P < 0.05). The multivariate regression analysis revealed a shorter relaxation time interval of the UES as the main risk factor for aspiration (OR, 0.03; 95% CI, 0.01–0.65; Table). Area under the receiver operating characteristic curve for diagnosis based on relaxation time interval was 0.913 ± 0.056. When target specificity was set at ≥ 60%, the highest sensitivity was 89% at relaxation time interval In addition, median intrabolus pressure and nadir pressure of the UES in patients with aspiration were significantly higher than those in patients without aspiration (27.89 ± 6.8 mmHg and 12.34 ± 4.81 mmHg, and 16.60 ± 9.74 mmHg and 4.56 ± 8.10 mmHg, respectively, P < 0.05; Fig. 5). However, there was no significant difference in the resting pressure of the UES between patients with aspiration and those without aspiration. In this study, we demonstrated that residues remaining in the pyriform sinus on VFSS were the result of decreased mesopharyngeal and hypopharyngeal contractility, and the occurrences of aspiration were significantly associated with shortened relaxation time interval of the UES. In addition, median intrabolus pressure and nadir pressure of the UES in patients with aspiration were significantly higher than those in patients without aspiration. 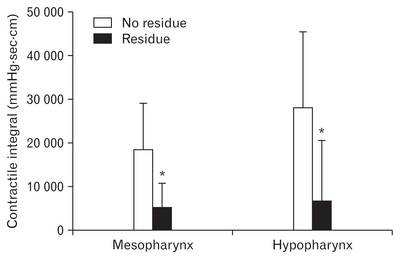 Weak mesopharyngeal and hypopharyngeal contractility were the important causes of residue in the pyriform sinus in this study. These results were consistent with those of earlier studies which showed that patients with dysphagia had weak pharyngeal contractions and high UES residual pressures in manometry,8 and presence of bolus residue in the pyriform sinus was significantly associated with lower peak amplitude of pressure wave at the sensor in the hypopharynx.16 Although other manometric metrics were also suggested to be related to the occurrence of residue in the pyriform sinus, including high UES resting pressure, pharyngeal spasm, and incoordination between UES relaxation and pharyngeal contraction, those metrics were not associated with pyriform sinus residue in this study. However, UES resting pressure was negatively associated with relaxation time interval (r = −0.500, P < 0.05), and stroke patients with high UES resting pressure had a tendency to have a short relaxation time interval of the UES. Contrary to our expectations, lower mesopharyngeal contractility was not related to the development of vallecular residues. Bolus propulsion through the pharynx is a combination of posterior tongue thrust and sequential caudally oriented contraction of the pharyngeal constrictors.2 Therefore, residue might remain in the vallecula when there is insufficient contact between base of the tongue and the posterior pharyngeal wall. One possible explanation is that viscosity is another important factor for the development of vallecular residue. In fact, our preliminary study demonstrated that residue remained in the vallecula when patients with lower mesopharyngeal contractility swallowed thicker food, such as yogurt. A second possible explanation is that a specific part of the mesopharynx (such as the base of the tongue or posterior mesopharyngeal wall), instead of total mesopharyngeal contractility, is more responsible for the presence of vallecular residue. 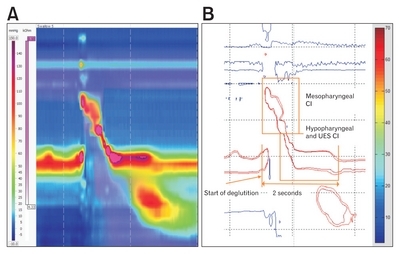 In this study, mesopharyngeal CI was the only indicator of contractility by the tongue base and mesopharyngeal wall, and this method could not verify which part of the mesopharynx is more responsible for the decreased mesopharyngeal contractility. More sophisticated methods to evaluate pharyngeal muscle incoordination should be explored in the future. One interesting finding of this study was the significant correlation between mesopharyngeal and hypopharyngeal CI in patients with dysphagia (r = 0.435, P < 0.01). This relationship was not identified in normal subjects. Also, hypopharyngeal CI in patients with dysphagia did not show any relationship with age, which was true in normal subjects.11 Because the mesopharynx and the hypopharynx receive the same neurologic innervation (except for the tongue),17 neurologic problems could have an effect on the muscular function of mesopharynx and hypopharynx simultaneously. Taken together, impaired UES relaxation is responsible for the development of aspiration, and these findings were in line with previous studies that showed the beneficial effect of dilatation of UES; Modified balloon dilatation improved UES relaxation duration, residual pressure, pharyngeal contraction, and oral intake in stroke patients with dysphagia.21 Similarly, botulinum toxin injection improved dysfunction of UES opening and aspiration.22 These results suggested that UES relaxation time interval and relaxation pressure might play a role in predicting aspiration. Limitations of our study were as follows: first, manometric catheter can only be placed in the lateral side of the UES opening. This can cause selection bias in measuring the functional status of the pharynx and UES. Hence, the catheter should be located in the weak side of the body especially in the evaluation of hemiplegias. Second, we used 2-dimensional image of pressure topography for analyzing the results. However, real food bolus passes through the 3- dimensional space of the pharynx and this makes it very difficult to estimate the pharyngeal contractile function properly. Third, we did not evaluate and classify the symptom severity of dysphagia. In this study, all patients had dysphagia, but only a portion of patients had abnormal VFSS. VFSS can be affected by abnormality of the contractility of the oropharyngeal muscle and UES opening. Further study is required to evaluate the correlation between VFSS, HRM, and severity of dysphagia symptoms. Fourth, there were small numbers of abnormal samples. The clinical importance of this study is to assess the parameter for predicting aspiration pneumonia as a fatal complication in stroke patients. This study is in progress on a larger case series and on the basis of these results, a new study is ongoing in the application of botulinum toxin injection for these patients, which can reduce the risk of aspiration and improve the quality of life. In conclusion, manometric measurements of the pharynx and UES were well correlated with abnormal findings in VFSS, and a shorter relaxation time interval of the UES during deglutition is an important parameter for the development of aspiration. Fig. 1. Isobaric contour image generated from binary manometric data. (A) Manoview image of 5 mL water swallow. (B) Isobaric contour generated from MATLAB program. Mesopharyngeal contractile integral (CI) was calculated by amplitude × duration × length (mmHg·sec·cm) of muscular contraction ≥ 70 mmHg. CI of the hypopharynx and upper esophageal sphincter (UES) was calculated in the same manner by amplitude × duration × length (mmHg·sec·cm) of muscular contraction ≥ 70 mmHg for 2 seconds after onset of deglutition. Adapted from Yoon et al. Fig. 2. The relationship between high-resolution manometry (HRM) spatiotemporal plot and video fluoroscopic swallowing study (VFSS) findings in patients with dysphagia. (A) A1 shows weak mesopharyngeal contractility on HRM, and isobaric contours generated from MATLAB program (muscular contraction ≥ 70 mmHg) (A2). (B) B1 shows weak hypopharyngeal contractility on HRM and isobaric contour generated from MATLAB program (B2), which was associated with the presence of residue in the pyriform sinus (black arrow) on VFSS (B3). (C) C1 shows shortened relaxation time interval of the upper esophageal sphincter on HRM and isobaric contour generated from MATLAB program (C2). Fig. 3. Comparison of mesopharyngeal and hypopharyngeal contractile integrals (CIs) between patients with and without residues in pyriform sinus. Mesopharyngeal and hypopharyngeal CIs in patients with residue in pyriform sinus were significantly lower than those in patients without residue in pyriform sinus. *P < 0.05. Fig. 4. Comparison of relaxation time intervals of the upper esophageal sphincter (UES) between patients with and without aspiration. Relaxation time intervals of the UES in patients with aspiration were significantly shorter than those in patients without aspiration. *P < 0.05. Fig. 5. Comparison of median intrabolus pressure, nadir pressure, and resting pressure between patients with and without aspiration. 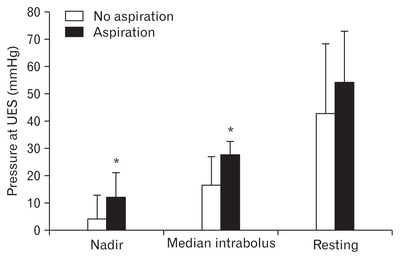 Median intrabolus pressure and nadir pressure in patients with aspiration were significantly higher than those in patients without aspiration. *P < 0.05.
aNadir pressure of the upper esophageal sphincter (UES) during deglutition. bMedian intrabolus pressure of the UES during deglutition. Martino, R, Foley, N, Bhogal, S, Diamant, N, Speechley, M, and Teasell, R (2005). Dysphagia after stroke: incidence, diagnosis, and pulmonary complications. Stroke. 36, 2756-2763. Dodds, WJ, Stewart, ET, and Logemann, JA (1990). Physiology and radiology of the normal oral and pharyngeal phases of swallowing. AJR Am J Roentgenol. 154, 953-963. Rubesin, SE (1995). Oral and pharyngeal dysphagia. Gastroenterol Clin North Am. 24, 331-352. Teasell, RW, McRae, M, Marchuk, Y, and Finestone, HM (1996). Pneumonia associated with aspiration following stroke. Arch Phys Med Rehabil. 77, 707-709. Kelly, AM, Drinnan, MJ, and Leslie, P (2007). Assessing penetration and aspiration: how do videofluoroscopy and fiberoptic endoscopic evaluation of swallowing compare?. Laryngoscope. 117, 1723-1727. Stoeckli, SJ, Huisman, TA, Seifert, B, and Martin-Harris, BJ (2003). Interrater reliability of videofluoroscopic swallow evaluation. Dysphagia. 18, 53-57. Butler, SG, Stuart, A, Castell, D, Russell, GB, Koch, K, and Kemp, S (2009). Effects of age, gender, bolus condition, viscosity, and volume on pharyngeal and upper esophageal sphincter pressure and temporal measurements during swallowing. J Speech Lang Hear Res. 52, 240-253. Olsson, R, Castell, JA, Castell, DO, and Ekberg, O (1995). Solid-state computerized manometry improves diagnostic yield in pharyngeal dysphagia: simultaneous videoradiography and manometry in dysphagia patients with normal barium swallows. Abdom Imaging. 20, 230-235. Lan, Y, Xu, G, Dou, Z, Lin, T, Yu, F, and Jiang, L (2015). The correlation between manometric and videofluoroscopic measurements of the swallowing function in brainstem stroke patients with dysphagia. J Clin Gastroenterol. 49, 24-30. Olsson, R, Nilsson, H, and Ekberg, O (1994). Simultaneous videoradiography and computerized pharyngeal manometry--videomanometry. Acta Radiol. 35, 30-34. Yoon, KJ, Park, JH, Park, JH, and Jung, IS (2014). Videofluoroscopic and manometric evaluation of pharyngeal and upper esophageal sphincter function during swallowing. J Neurogastroenterol Motil. 20, 352-361. Han, TR, Paik, NJ, and Park, JW (2001). Quantifying swallowing function after stroke: a functional dysphagia scale based on videofluoroscopic studies. Arch Phys Med Rehabil. 82, 677-682. Kwiatek, M, Mirza, F, Kahrilas, P, and Pandolfino, J (2009). Hyperdynamic upper esophageal sphincter pressure: a manometric observation in patients reporting globus sensation. Am J Gastroenterol. 104, 289-298. Castell, J, and Castell, DO (1993). Modern solid state computerized manometry of the pharyngoesophageal segment. Dysphagia. 8, 270-275. Omari, TI, Miki, K, and Davidson, G (1997). Characterisation of relaxation of the lower oesophageal sphincter in healthy premature infants. Gut. 40, 370-375. Pauloski, BR, Rademaker, AW, Lazarus, C, Boeckxstaens, G, Kahrilas, PJ, and Logemann, JA (2009). Relationship between manometric and videofluoroscopic measures of swallow function in healthy adults and patients treated for head and neck cancer with various modalities. Dysphagia. 24, 196-203. Matsuo, K, and Palmer, JB (2008). Anatomy and physiology of feeding and swallowing: normal and abnormal. Phys Med Rehabil Clin N Am. 19, Array-707. Noll, L, Rommel, N, Davidson, GP, and Omari, TI (2011). Pharyngeal flow interval: a novel impedance-based parameter correlating with aspiration. Neurogastroenterol Motil. 23, 551-e206. Omari, TI, Dejaeger, E, and van Beckevoort, D (2011). A method to objectively assess swallow function in adults with suspected aspiration. Gastroenterology. 140, 1454-1463. Putnam, PE, Orenstein, SR, Pang, D, Pollack, IF, Proujansky, R, and Kocoshis, SA (1992). Cricopharyngeal dysfunction associated with Chiari malformations. Pediatrics. 89, 871-876. Lan, Y, Xu, G, Dou, Z, Wan, G, Yu, F, and Lin, T (2013). Biomechanical changes in the pharynx and upper esophageal sphincter after modified balloon dilatation in brainstem stroke patients with dysphagia. Neurogastroenterol Motil. 25, e821-e829. Terré, R, Panadés, A, and Mearin, F (2013). Botulinum toxin treatment for oropharyngeal dysphagia in patients with stroke. Neurogastroenterol Motil. 25, 896-e702.